Inequitable school funding has been a problem since the inception of public education. A wide variety of studies by numerous researchers have concluded that funding influences academic achievement and academic achievement is tied to one's quality of life. Unfortunately, inequities in school finance often negatively affect disadvantaged populations. Perhaps the most salient perpetrator of inequities in school finance has been the use of local property taxes to fund schools. Schools in low-income neighborhoods often have less property wealth, which results in lower levels of school revenue. Across the nation, states have begun to look for new ways to effectively address major forms of school finance inequity. 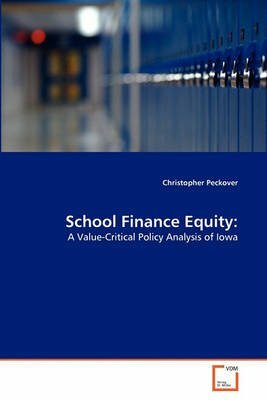 In this book, I outline the history of school finance in the United States, analyze the extant school finance policy in Iowa, discuss the effects of Iowa school finance policy on disadvantaged populations, and conclude with policy recommendations that I believe can help increase school finance equity.